Over the last few years, Kyle has created a series of cattail sculptures. Earlier this year, he was commissioned to create a custom sculpture in this line. Take a peek at the design and creation process below! Next up: making the cattail flowers. In the first photo, we're using a fullering tool on the anvil to shape tube steel. The last photo shows the needle gun we use to create the texture on the cattail. We used angle iron to create the leaves. Here we're cutting the ends into points, then shaping the leaves hot using a bending dog in the the vise. To make the base, we cut the shape out of steel plate. We added texture later on with the hammer. And now to assemble all the parts! This piece was finished with a rust patina, a finish that works well with the subject matter and holds up great for exterior work. Here the piece is installed on the happy owner's front porch! 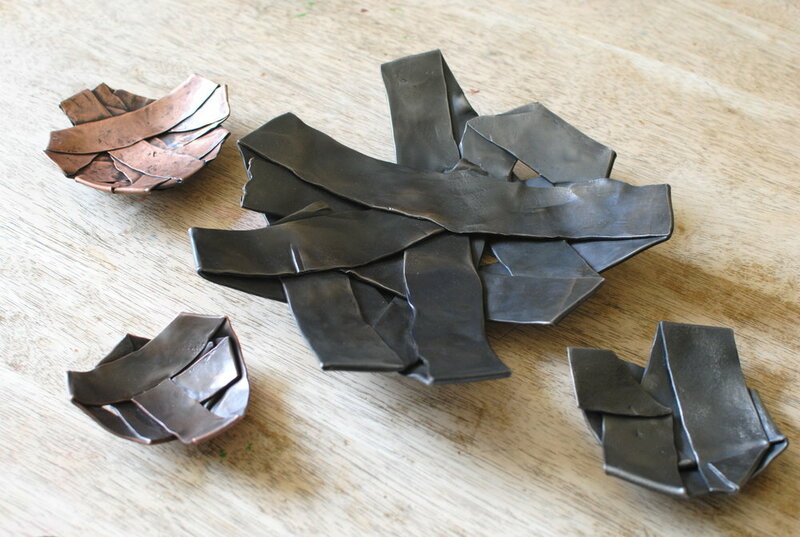 Kyle has been working on a series of works created from flattened, folded metal pipe for a couple of years now. Check out the story of how they have evolved from fairly small bowls to extra-large wall sculptures! This is the first batch of folded bowls Kyle ever created. They're made from reclaimed metal pipe from demolished warehouses in the historic Shockoe Bottom area of Richmond. He originally imagined the smaller size as catch-alls for keys, wallets, and anything you need as you head out the door. The larger size would be great to hold remotes, or better yet, on their own as a sculptural item on your mantle or coffee table. As it turned out, the larger size quickly became the more popular size. Kyle created larger and larger bowls, some so big they required multiple heats in our small gas forge. He also experimented with his first wall pieces, the original Entangled series of three wall sculptures, each about 12" x 18". Last spring, for our group show, GROWTH, Kyle created a new wall sculpture, the biggest to date. Entangled #4 measures 12" x 36". This winter Kyle was commissioned to created a large 36" x 36" version of his original wall sculpture. Here he is working on the piece in the studio (above), with the finished piece below.